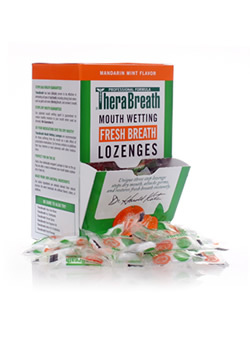 I had the opportunity to use TheraBreath Toothpaste, Oral Rinse, and Fresh Breath Lozenges with the entire family. I have never heard of TheraBreath before, but I love their products. We will definitely be purchasing more. 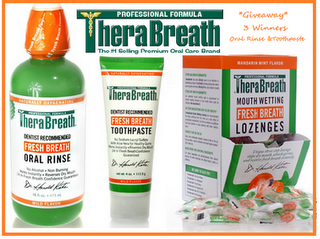 TheraBreath was created by Dr. Harold Katz to help his own daughter with her problem of bad breath. The exclusive formula has been used by over 1,000,000 people since 1994 to solve their problems with bad breath and unpleasant mouth taste. Their products do not contain harsh chemicals like alcohol, saccharin, sodium lauryl sulfate, benzalkonium chloride. If you have any questions about the TheraBreath products you can have a live chat to get them answered right away. They offer a 30 day money back guarantee on their products. The Fresh Breath Toothpaste~ My husband has very sensitive gums and the dentist has recommended that he use toothpaste without Sodium Lauryl Sulfate. He has tried every brand of toothpaste that we could find with and without this, but none of them have helped. He noticed a huge difference once he started using TheraBreath Toothpaste. I noticed that my mouth feels cleaner longer. Even my 6 year old likes this toothpaste. It has a mild citrus mint flavor, but doesn't have an overly sweet taste. Fresh Breath Oral Rinse ~ The oral rinse tastes a lot different from regular mouth wash. It contains no alcohol so it has a very mild flavor that my kids even liked. I have never found a mouth wash that my younger kids would use until now. The Fresh Breath Lozenges ~ The orange mint flavored lozenges are individually wrapped mints that are very easy to take along in your purse or pocket. The mints work in three stages to make sure your mouth feels fresh, moist, and healthy, unlike any mint I have tried. I always keep a pack of gum in my purse for when I feel like I need to freshen my breath. I usually don't like mints because they tend to taste to sweet and I feel like I have to keep using them to retain fresh breath. I didn't have that feeling with these mints, they do freshen your breath. Alaina, my 6 year old daughter loves the packaging, they come in a box that can be opened to use like a dispenser. She wanted the container to be kept on a little table we have beside our door in case people that came to our house wanted to have one. My daughter-in-law liked them so much she would grab one every time she came over. My daughters friend came to visit from CO and she had a sore throat, she tried them and she said that they felt good on her throat & took a hand full for her trip home. Since they are individually wrapped Alaina would also put a mint beside every plate when she set the table for dinner, so everyone could have fresh breath. Now to the fun part! Two lucky people can win a toothpaste and an oral rinse. For your first entry visit the TheraBreath website and tell me what you would like to try from them. Follow me with Google Friend Connect. Follow me with Networked Blogs. This giveaway will be open until Monday March 7th at midnight. I will announce two winners on March 8th. I received TheraBreath Toothpaste, Oral Rinse, and Fresh Breath Lozenges free to use in our household in exchange for my review of their products. Hey Lisa. I would like to try the Dr. Katz for Dogs + Cats Oral Solution. Well my dog would anyway, ha-ha. I'm new and now following you on GFC. I'm a new follower on networked blogs too as tracy suzanne. I hope you'll stop by and visit when you get the chance.